DURHAM, NC- January 10, 2017 – After setting attendance records in 2016, DPAC is once again ranked among the top theaters in America, according to three leading national magazines that cover live U.S. entertainment events and venues. 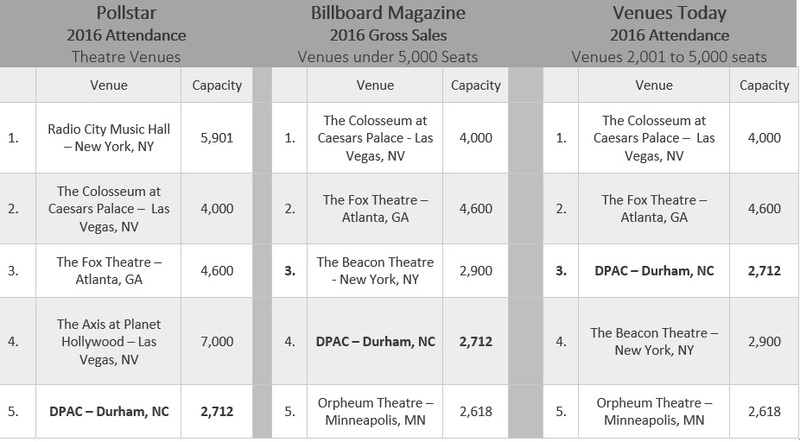 In their year-end published attendance and sales rankings, Pollstar, Billboard and Venues Today all placed DPAC among the country’s top five venues among reporting venues of its size and type. DPAC’s 2016 calendar year featured 235 events which drew a record-setting 490,883 guests and 108 sellouts. 2016 represents DPAC’s eighth year of operation under the direction of Nederlander and Professional Facilities Management (PFM). DPAC ranked 5th in Pollstar, 4th in Billboard, and 3rd in Venues Today. Heading the list of the highest attended shows in 2016 were encore presentations of Disney’s The Lion King, which entertained sellout crowds every night during its multi-week run in February and March, and the Book of Mormon. Both were part of DPAC’s signature series, SunTrust Broadway at DPAC. Dr. Seuss’ How the Grinch Stole Christmas! The Musical helped fill guests with the holiday spirit – and collaborated with the Autism Society of North Carolina and Duke Health to offer DPAC’s first-ever special sensory-friendly performance. In addition to Broadway blockbusters, DPAC again delivered an incredible variety of events that truly offered ‘something for everyone’. The legendary Queen of Soul Aretha Franklin led DPAC’s concert sellouts, followed by pop veterans Duran Duran, blues singer Joe Bonamassa, and Nobel Peace Prize winner Bob Dylan. Comedy also played a big role in DPAC's year with Jeff Foxworthy & the Cable Guy, Ron White and Lewis Black each drawing large crowds to their multi-performance engagements. Special events included Food Network star Alton Brown’s “Alton Brown Live: Eat Your Science,” and a special run of Love Jones – The Musical, a musical stage adaptation of the renowned 1997 film.